Streptomyces species are widely distributed in natural habitats, such as soils, lakes, plants and some extreme environments. Replication loci of several Streptomyces theta-type plasmids have been reported, but are not characterized in details. Conjugation loci of some Streptomyces rolling-circle-type plasmids are identified and mechanism of conjugal transferring are described. We report the detection of a widely distributed Streptomyces strain Y27 and its indigenous plasmid pWTY27 from fourteen plants and four soil samples cross China by both culturing and nonculturing methods. The complete nucleotide sequence of pWTY27 consisted of 14,288 bp. A basic locus for plasmid replication comprised repAB genes and an adjacent iteron sequence, to a long inverted-repeat (ca. 105 bp) of which the RepA protein bound specifically in vitro, suggesting that RepA may recognize a second structure (e.g. a long stem-loop) of the iteron DNA. A plasmid containing the locus propagated in linear mode when the telomeres of a linear plasmid were attached, indicating a bi-directional replication mode for pWTY27. As for rolling-circle plasmids, a single traA gene and a clt sequence (covering 16 bp within traA and its adjacent 159 bp) on pWTY27 were required for plasmid transfer. TraA recognized and bound specifically to the two regions of the clt sequence, one containing all the four DC1 of 7 bp (TGACACC) and one DC2 (CCCGCCC) and most of IC1, and another covering two DC2 and part of IC1, suggesting formation of a high-ordered DNA-protein complex. This work (i) isolates a widespread Streptomyces strain Y27 and sequences its indigenous theta-type plasmid pWTY27; (ii) identifies the replication and conjugation loci of pWTY27 and; (iii) characterizes the binding sequences of the RepA and TraA proteins. Streptomyces species are widely distributed in natural habitats, such as soils, lakes, plants and some extreme environments [1, 2]. They are Gram-positive, mycelial bacteria with high G+C content (often >70%) in their DNA . More than 6000 antibiotics and pharmacologically active metabolites (e.g. antiparasitic and antitumor agents, immuno-suppressants etc.) have been discovered in Streptomyces species . Streptomyces species usually harbor conjugative plasmids . Modes of plasmid replication in Streptomyces include rolling-circle (RC) (e.g. pIJ101, pJV1, pSG5, pSN22, pSVH1, pSB24.2, pSY10 and pSNA1) , and uni-directional or bi-directional theta types (e.g. SCP2, pFP11 and pFP1) [7, 8]. Some plasmids (e.g. SLP1 and pSAM2) replicate in chromosomally-integrating/autonomous forms [9–11]. Streptomyces RC plasmids are usually small (8–13 kb), while theta-type plasmids are larger (31–120 kb). Replication loci of Streptomyces RC plasmids comprise a single rep gene, a dso (double-strand origin) for initiation and termination of replication, and an sso (single-strand origin) for conversion of the lagging strand into a double-stranded molecule . The replication locus of the theta-type SCP2 comprises repI and repII genes and an adjacent non-coding sequence to which RepI protein binds [7, 13]. pFP1 and pFP11 contain basic replication loci of rep and iteron types (direct repeats and/or inverted repeats), to which Rep proteins bind . Conjugal transfer of Streptomyces RC plasmid (e.g. pIJ101) needs a tra gene along with a clt (cis-acting locus of transfer) site . Streptomyces tra genes encode a DNA translocase resembling the chromosomal DNA translocase FtsK of E. coli or SpoIIIE of B. subtilis, with double-stranded DNA probably entering the recipient . The TraB of pSVH1 binds to the clt sequence as multimers on the mobilized plasmid and translocates unprocessed DNA at the hyphal tip to a recipient cell . Conjugal transfer of Streptomyces theta-type plasmids (e.g. SCP2 and pZL12) requires a major tra gene and two adjacent genes [17, 18]. In contrast to most bacteria, Streptomyces species often harbor linear plasmids [19, 20]. Unlike the terminal protein-capped linear replicons of adenoviruses that replicate by a mechanism of strand displacement , Streptomyces linear plasmids start replication from a centrally located ori locus  and replication proceeds bi-directionally toward the telomeres . At least some Streptomyces linear plasmids (e.g. pSCL1) can propagate in circular mode when the telomeres are deleted , while some theta-type circular plasmids (e.g. SCP2 and pFP11) can also propagate in linear mode when the telomeres from a linear plasmid are attached . During the course of investigating naturally circular plasmids, we detected 27 plasmids among ~300 newly isolated actinomycete strains from plant samples of Gingko, Taxus and Artemisia annua L in China. Interestingly, 14 of them (Table 1) displayed similar sizes of ca.14-kb DNA bands on agarose gel. 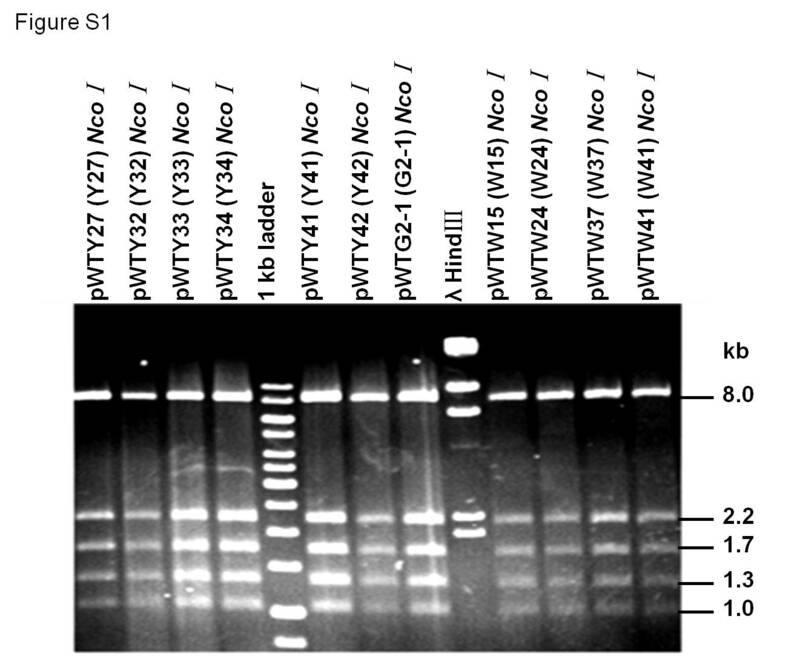 These plasmids were digested with NcoI and all showed five bands (~8, 2.2, 1.7, 1.3 and 1 kb) on gel electrophoresis (Additional file 1: Figure S1), suggesting that they were an identical plasmid (designated pWTY27). The 16S rRNA genes of the 14 strains were PCR-amplified and all showed the same sequence, resembling those of Streptomyces species (e.g. S. albidoflavus, S. globisporus and S. coelicolor, identity 99%). The chromosomal oriC regions of these strains were also PCR-amplified with primers from the conserved dnaA and dnaN genes and all these oriC sequences were identical. 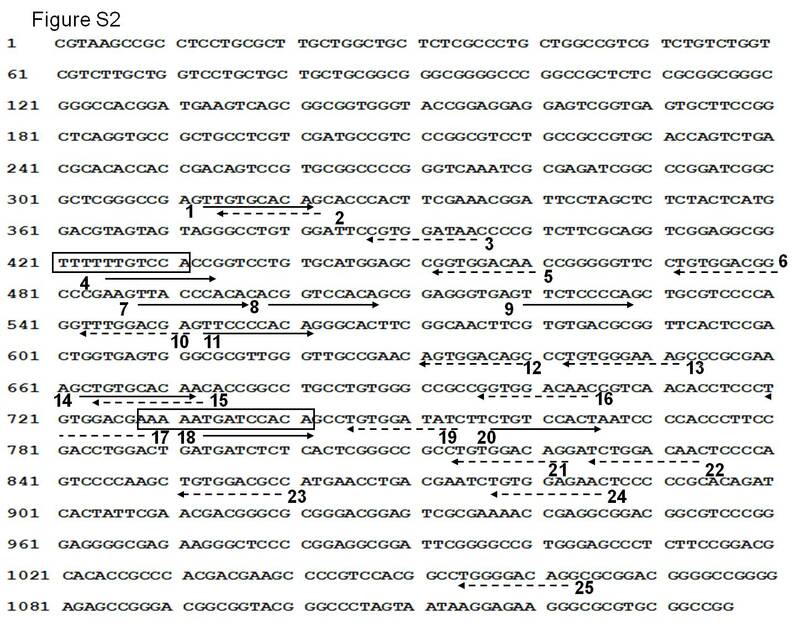 As shown in Additional file 2: Figure S2, its 1136-bp non-coding sequence was predicted to contain 25 DnaA binding-boxes (including nine forward and sixteen reverse) of 9 bp ([T/C][T/C][G/A]TCCAC[A/C]), resembling that of typical Streptomyces (e.g. 17 DnaA boxes of 9 bp [TTGTCCACA] for S. lividans) . The genomic DNA of these strains was digested with SspI and electrophoresed in pulsed-field gel. As shown in Additional file 3: Figure S3, genomic bands of these strains were identical. These results suggested that the 14 strains were identical (designated Streptomyces sp. Y27). The unique SacI-treated pWTY27 was cloned in an E. coli plasmid pSP72 for shotgun cloning and sequencing (see Methods). The complete nucleotide sequence of pWTY27 consisted of 14,288 bp with 71.8% GC content, resembling that of a typical Streptomyces genome (e.g. 72.1% for S. coelicolor) . Fifteen open reading frames (ORFs) were predicted by “FramePlot 4.0beta” (Additional file 4: Figure S4); seven of them resembled genes of characterized function, while eight were hypothetical or unknown genes. These ORFs were grouped into two large presumed transcriptional units (pWTY27.5–4c, pWTY27.5–14; Additional file 5: Table S1). Interestingly, five ORFs of pWTY27.2c resembled these of of pSG2 of S. ghanaensis (DNA polymerase, SpdB2, TraA, TraB and resolvase). pWTY27.9 containing a domain (from 246 to 464 amino acids) for DNA segregation ATPase FtsK/SpoIIIE resembled a major conjugation Tra protein of Streptomyces plasmid pJV1 (NP_044357). Like other Streptomyces plasmids (e.g. SLP1 and SCP2), pWTY27 encodes genes showing similarity to transcriptional regulator kor (kill-override), spd (plasmid spreading) and int (integrase) genes. Unexpectedly, pWTY27.11 resembled a chromosomally encoded phage head capsid in Nocardia farcinica IFM 10152, suggesting the occurrence of a horizontal transfer event between plasmid and phage. 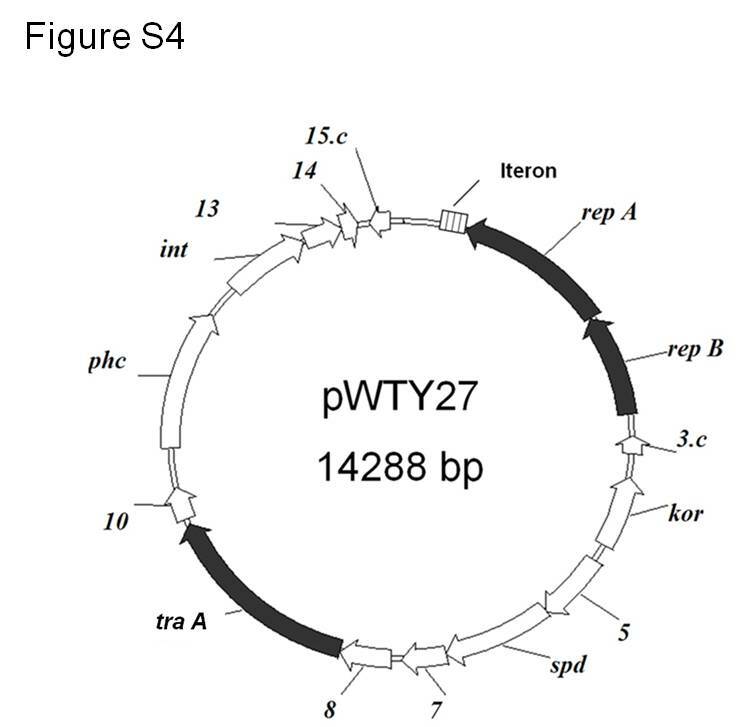 To identify a locus for plasmid replication, various pWTY27 fragments were sub-cloned into an E. coli plasmid pFX144 containing a Streptomyces apramycin resistance marker and were introduced by transformation into S. lividans ZX7. As shown in Figure 1a, plasmids (e.g. pWT24, 26, 147 and 219) containing pWTY27.1c, 2c and a 300-bp non-coding sequence (321–620 bp, ncs) could replicate in S. lividans ZX7, but deletion of pWTY27.2c (i.e. pWT217 and pWT33) or pWTY27.1c (pWT34) or the ncs (pWT222) abolished propagation in S. lividans ZX7. Adding the 300-bp ncs (pWT223), but not a 149-bp ncs (382–530, pWT241), to pWT222 restored its replication activity. Co-transcription of pWTY27.1c and 2c was confirmed by PCR amplification of their co-transcribed RNA products into cDNA (Figure 1b). These results indicated that a basic locus for pWTY27 replication was pWTY27.1c (designated repA), pWTY27.2c (repB) and a 300-bp (from 321 to 620 bp) ncs. 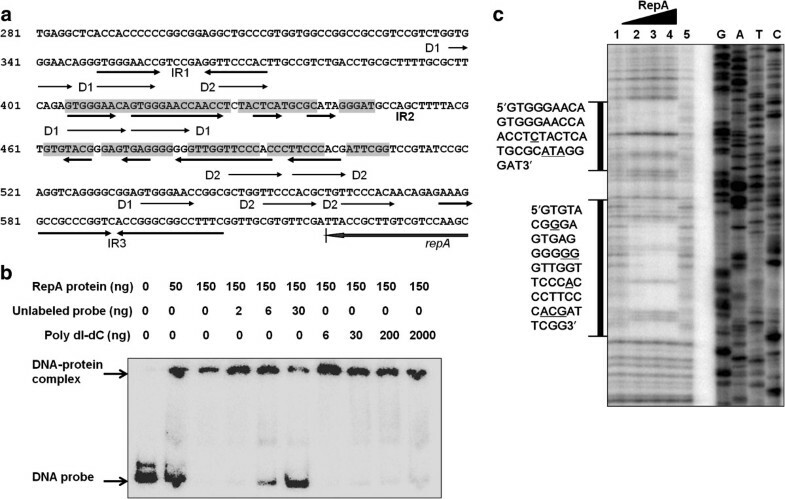 Identification of a pWTY27 locus required for replication in Streptomyces lividans. (a). Identification of a replication locus. Plasmids were constructed in E. coli (see Methods and Table 1), and introduced by transformation into S. lividans ZX7. Positions of these cloned fragments on pWTY27 and transformation frequencies are shown. The ncs is indicated by striped boxes, relevant genes by open arrowheads and the two replication genes by filled arrowheads. (b). RT-PCR of a transcript overlapping the consecutive replication genes. RNA of strain Y27 was isolated and reverse-transcribed into cDNA. The cDNA, RNA and Y27 genomic DNA were used as templates for PCR amplification and their products were electrophoresed in 1.5% agarose gel at 20 V/cm for 1 h.
pWT26 was introduced by conjugation from E. coli ET12567 (pUZ8002) into 10 randomly-selected endophytic Streptomyces strains (different 16S rRNA sequences, e.g. Y22, Y45, Y19, Y24, Y8, Y51, Y10, Y31, Y72 and Y3), and apramycin resistant transconjugants were obtained from eight of them, indicating a wide host range for this plasmid. The pWTY27 RepB was predicted to be a DNA primase/polymerase and RepA a hypothetical protein. The 300-bp ncs was predicted as an iteron containing five direct repeats of 8 bp (DR1, GTGGGAAC), five direct repeats of 7 bp (DR2, TTCCCAC) and three pairs of inverted repeats (IR1–IR3, Figure 2a). To see if there was an interaction between the RepA protein and this iteron sequence, electrophoretic mobility shift assays for DNA-protein complex formation were employed. The 6His-tagged RepA protein was incubated with a [γ-32P]ATP-labeled iteron DNA, and then electrophoresed and autoradiographed. As shown in Figure 2b, the “shifted” DNA bands were visualized by adding RepA protein, indicating that the RepA protein could bind to the DNA probe to form a DNA-protein complex. Formation of this complex was inhibited by adding a 15-fold excess of unlabeled probe but was not affected by adding even a 1000-fold excess of polydIdC DNA as a non-specific competitor, indicating that the binding reaction of the RepA protein with iteron DNA was highly specific. Characterization of the binding reaction of Rep1A protein with iteron DNA by EMSA and footprinting. (a). Iteron of pWTY27. Possible iteron sequences from 338 to 606 bp on pWTY27 and AT-rich regions are shown. DR: direct repeat; IR: inverted repeat. The RepA binding sequences determined by DNA footprinting are boxed. The binding sequences of RepA protein are indicated by shading. (b). Detection of the binding activity of RepA protein with the iteron by EMSA. The DNA probe for each lane was 2 ng and the unlabeled probe was also used as specific competitor. The DNA-protein complex is indicated. (c). Determination of the binding sequence by DNA footprinting. The γ[32p]ATP-radiolabelled primer was sequenced and electrophoresed (lanes G, A, T and C) as a control. The amounts of RepA protein used in lanes 1–5 were 0.17, 0.43, 0.85, 2.6 and 0 μg, respectively. Two sequences protected by RepA from digestion with DNaseI are shown and the RepA unbound sequences are underlined. To precisely determine the binding sequence of the RepA protein and iteron DNA, a “footprinting” assay was employed. As shown in Figure 2c, two sequences (405–447 bp and 462–509 bp) protected from digestion with DNaseI were visualized on adding RepA protein. These sequences (405–509 bp) covered intact IR2 (overlapping with some DR1 and DR2) of the iteron (Figure 2a). The replication locus of pWTY27 comprised rep and an iteron, resembling those of bi-directionally replicating Streptomyces plasmids (e.g. pFP11) . To see if pWTY27 could also replicate in linear mode when the telomeres of a linear plasmid were attached, we constructed pWT177 (Figure 3), containing the replication locus of pWTY27, and two 381-bp functional telomeres of linear plasmid pSLA2 . 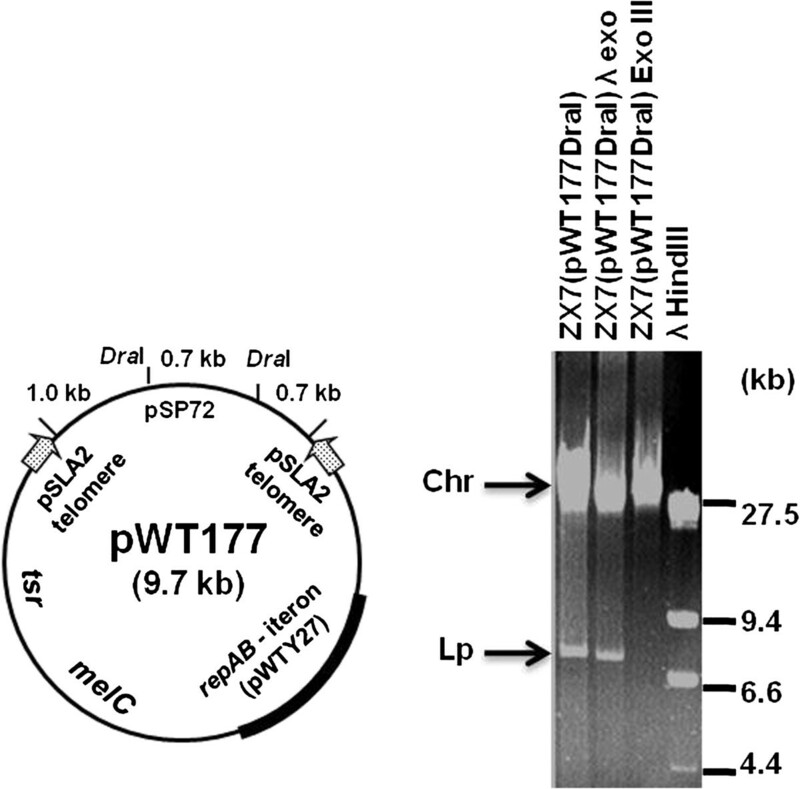 DraI-linearized pWT177 DNA from E. coli was introduced by transformation into S. lividans ZX7. Transformants were obtained at a frequency of 5 × 103/μg DNA. Genomic DNA was isolated, and a ~7.3-kb plasmid DNA band was detected on an agarose gel. As shown in Figure 3, this band was resistant to treatment by λ exonuclease but sensitive to E. coli exonuclease III, suggesting that it was a double-stranded linear DNA with free 3′ but blocked 5′ ends. 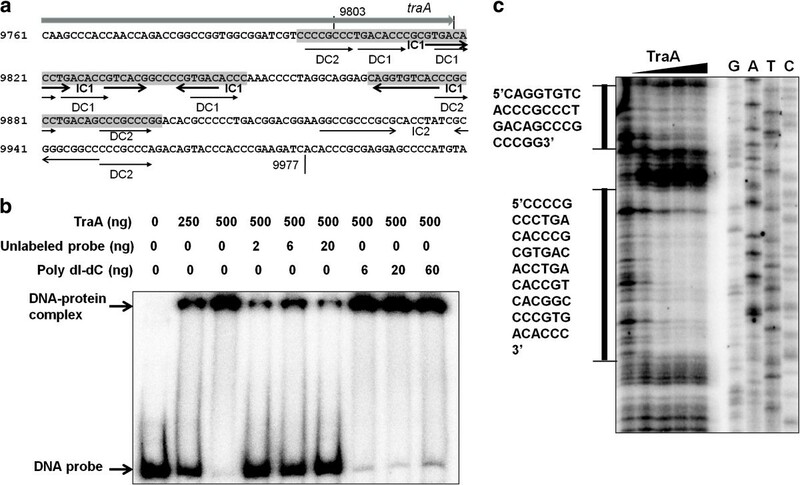 A plasmid containing the pWTY27 replication locus and pSLA2 telomeres propagated in linear mode in Streptomyces. Aliquots of genomic DNA were treated with E. coli exonuclease III and bacteriophage λ exonuclease and electrophoresed in 0.7% agarose gel at 1.3 V/cm for 12 h. Chromosomal (Chr) and linear plasmid (Lp) bands are indicated. pWTY27.9 resembled the major conjugation protein Tra of Streptomyces plasmid pJV1 . As shown in Figure 4a, plasmids (e.g. pWT208 and pWT210) containing pWTY27.9 and its adjacent 159-bp sequence (9819–9977) could transfer at high frequencies. Deletion of pWTY27.9 (pWT207) abolished transfer of the plasmid. Complete (pWT224) or partial deletion (pWT225) of the 159-bp sequence decreased transfer frequencies ca. 1000- and 10-fold, respectively. Thus, a basic locus for pWTY27 transfer comprised pWTY27.9 (designated traA) and its adjacent ~159-bp sequence. Identification of a pWTY27 locus for conjugal transfer in Streptomycescxx (a) and (b). Transfer frequencies of the plasmids in Streptomyces lividans are shown. Relevant genes are indicated by open arrowheads while tra is indicated by an arrowhead, and a possible clt by striped boxes. To precisely determine the essential segment of the short sequence for plasmid transfer, various fragments were PCR-amplified and then cloned into pWT224 containing intact traA but not the 159-bp sequence. As shown in Figure 4b, a plasmid (pWT242) containing a 175-bp fragment (a 16-bp sequence within traA and the 159-bp non-coding sequence, cis-acting-locus of transfer, designated clt) could transfer at a high frequency. Deletions of 10 bp within traA (pWT259) decreased transfer frequency ca. 1000-fold. Deletions of 88 bp (pWT231) and 129 bp (pWT262) of the clt decreased transfer frequencies ca. 10- and 1000-fold, respectively. These results suggested that the essential region for plasmid transfer was ca. 87 bp covering 16 bp within traA and its adjacent 71 bp (9803–9889), while the 88 bp (9890–9977) next to it also played a role in plasmid transfer. Two trans-membrane domains (68–90 and 102–124 aa) in the 688-aa TraA protein were predicted (http://www.cbs.dtu.dk/services/TMHMM-2.0/). A truncated TraA (125–688 aa) lacking the trans-membrane domains could be expressed in E. coli as soluble protein. The 175-bp clt sequence (9803–9977) contained four direct repeats (DC1, TGACACC; DC2, CCCGCCC) and two inverted repeats (IC1 and IC2) (Figure 5a). To see if there was an interaction between TraA protein and the clt sequence, a “band-shift” assay for DNA-protein complex formation was employed. As shown in Figure 5b, TraA protein could bind to the DNA probe to form a DNA-protein complex. Formation of this complex was inhibited by adding 1–10 fold excess of unlabeled probe but was not affected by adding a 30-fold (even 1000-fold, data not shown) excess of polydIdC DNA as a non-specific competitor, indicating that the binding reaction of the TraA protein with the clt DNA was highly specific. Characterization of the binding reaction of TraA protein with clt DNA by EMSA and footprinting. (a). Characteristics of a clt sequence on pWTY27 for plasmid transfer. Possible DC (direct repeat) and IC (inverted repeat) sequences are shown. (b) as Figure2(b). (c) as Figure2(c). The amounts of TraA protein used in lanes 1–5 were 0, 0.6, 1.4, 2.8 and 4.2 μg, respectively. Two sequences protected by TraA from digestion with DNaseI are shown. A “footprinting” assay was employed to precisely determine the binding sequence of TraA protein and clt DNA. As shown in Figure 5c, two sequences (9797–9849 bp and 9867–9897 bp) protected from digestion with DNase I were visualized on adding TraA protein. One sequence (9797–9849 bp) covered all the four DC1 and one DC2 and most of IC1, and another (9867–9897 bp) covered two DC2 and part of IC1 of the clt (Figure 5a). The pWTY27 sequence contained four DR1 within the clt while carrying fifteen DC2 distributing randomly in the plasmid, suggesting an essential role of the DC1 for plasmid transfer. By detecting the indigenous plasmid pWTY27, we have identified a widely distributed Streptomyces strain Y27 among plant samples. To see if this species along with the plasmid could also reside in soil, we collected 12 soil samples from 12 cities of nine provinces in China. Soil genomic DNA was isolated and PCR-amplified with primers from the repA of pWTY27 and the oriC of Y27. As shown in Figure 6, PCR bands were visualized from five samples (1, 2, 3, 5 and 9) for repA and also five samples (1, 3, 5, 8 and 9) for oriC, while no PCR bands were obtained for the oriC of S. ceolicolor A3(2) from the twelve soil samples. There was a correlation between the repA and the oriC in four samples (1, 3, 5 and 9), while repA, but not oriC, was detected from sample 2, and oriC, but not repA, from sample 8. These PCR bands were sequenced, showing that the repA sequences of samples 1 and 5 were identical to that of pWTY27, while one point mutation (C changed to A at 1878-bp of pWTY27) was found in that of sample 3, one mutation (G to T at 1895 bp) in sample 9, and twelve point mutations in sample 2. The oriC sequences of samples 1, 3, 8 and 9 were identical to that of Y27, while there was one point mutation (C to A at 955-bp of the 1433-bp oriC sequence) in sample 5. These results indicated that a number of point mutations for the repA and oriC occurred from these soil samples. PCR amplifications of possible pWTY27 repA and oriC from the genomic DNA of soil samples. Twelve soil samples (lanes 1–12) were collected, soil genomic DNA was isolated and nested PCR amplifications with primers of the pWTY27 repA, Y27 and A3(2) oriC were performed (Methods). More than 500 species or sub-species in the genus Streptomyces have validly been designated and published . However, whether there was some predominant Streptomces species in natural habitats was not clear. From six isolates of an endophytic (wheat plant) Streptomyces species across South Australia, a 12,855-bp plasmid pEN2701 was identified . Here, we report identification of a 14,288-bp plasmid pWTY27 in an endophytic Streptomyces species Y27 from fourteen plant samples of Gingko, Taxus and Artemisia annua L across China. By integrating the egfp gene (encoding green fluorescence protein) in the Y27 chromosome and then infecting leaves of Ginkgo, however, we could not detect Y27 strains growing inside the leaves (T. Wang and Z. Qin, unpublished data). 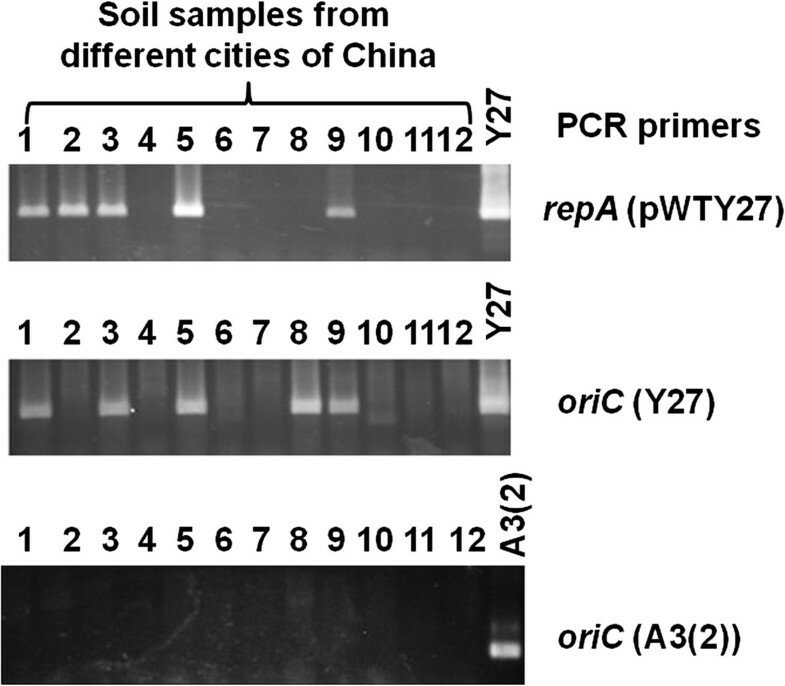 By PCR amplification of soil genomic DNA and sequencing, we found that four out of the 12 soil samples collected from 12 cities in China contained similar repA of pWTY27 and oriC of Y27. However, the absence of pWTY27-repA and YT27-oriC in certain soil samples can also be explained by the presence of a PCR-inhibitor (e.g. contamination with humic acids) in the soil samples that gave negative results. The sequence of pWTY27 does not resemble that of pEN2701, and the oriC sequence of Y27 is unique in the GenBank database. Thus, we identified a widely distributed Streptomyces species along with its indigenous plasmid from some plants and soils cross China by both culturing and nonculturing methods. Existence of a widely distributed species in natural habitats might reflect a versatile capacity to resist stresses. The basic replication locus of pWTY27 comprises repAB genes and an iteron sequence, resembling that of Streptomyces theta-type plasmids SCP2 (repI/repII) , pFP11 and pFP1 (repA/iteron) . Given the model of bi-directional replication of Streptomyces linear replicons , like SCP2 and pFP11 , the pWTY2-rep locus with artificially attached telomeres from a Streptomyces linear plasmid is also able to propagate in linear form, indicating that it replicates in a bi-directional mode. The RepI of SCP2 binds to an upstream sequence of the repI gene . The RepA proteins of pFP1 and pFP11 bind specifically to their iterons . The RepA of pWTY27 also binds highly specifically to the iteron in vitro, and further DNA “footprinting” showed that the protein binds to intact IR2, which overlaps with some DR1 and DR2, but leaving some spacers, especially the “loop” of the IR2 unprotected from digestion with DNaseI. 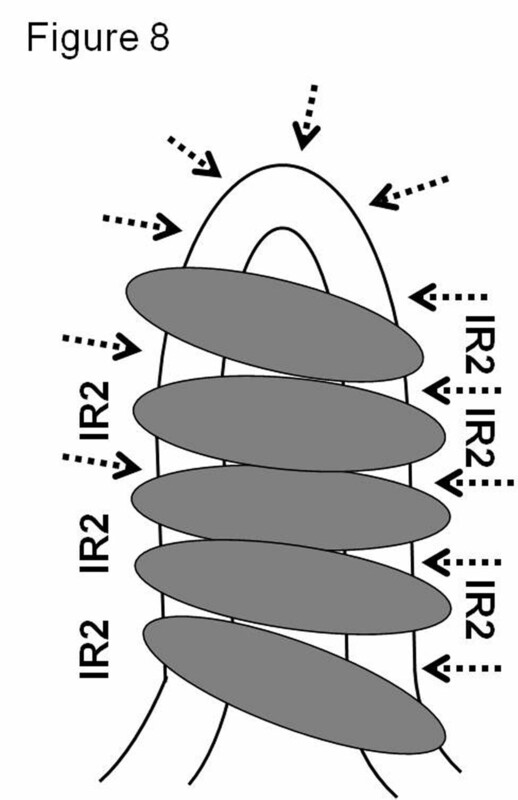 The long IR2 sequence may fold back to form hairpin structure. In fact, DR2 (GTGGGAAC) is almost the complementary sequence of DR1 (TTCCCAC), which means it is the same repeat but on the opposite strand. These results suggest that RepA may form multimers and recongnize a second structure (e.g. long stem-loop of the IR2) of the iteron DNA (Figure 7). A model for interaction of the pWTY27 RepA and the iteron. The replication origin of plasmid pWTY27 contains multiple directed and inverted repeat sequences (DRs and IRs, Figure 2a). 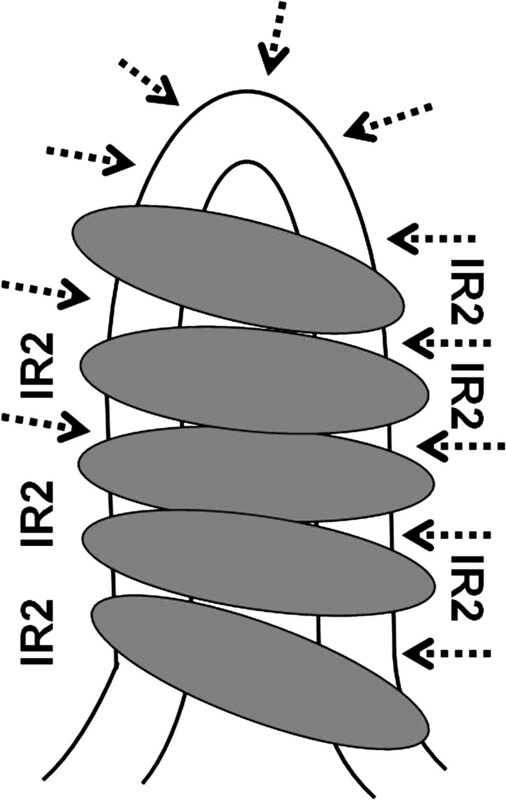 The IR2 is a long discontinous inverted-repeat sequence and may fold back itself during initiation of replication. Since there are six unbound sites (see Figure 2a) and RepA is a large protein (522 amino acids), we suggest that five RepA molecules (indicated by filled ovals) may bind to the folding-back IR2 region leaving six unbound sites (indicated by arrowheads). Conjugal transfer of Streptomyces theta-type plasmids (e.g. SCP2 and pZL12) requires a major tra and its adjacent genes [17, 18], while that of Streptomyces RC-type plasmids (e.g. pIJ101 and pJV1) needs a tra gene and a clt site [14, 30]. The minimal pIJ101 clt-locus consists of a sequence ~54 bp in size that includes an essential imperfect inverted repeat and three direct repeats (5 bp, GC/AAAC) sequences and is located close to the korB gene . The pJV1 clt region contains nine direct repeats (9 bp, CCGCACA[C/G][C/G]) and two pairs of imperfect inverted repeats [30, 32]. Like these Streptomyces RC-type plasmids, conjugal transfer of the theta-type pWTY27 requires a major tra gene and its adjacent sequence. Such a clt locus in pWTY27 has a 16-bp sequence within the traA gene. The 175-bp clt sequence contains four direct repeats of DC1 (7 bp, TGACACC)/DC2 (7 bp, CCCGCCC) and two inverted repeats (IC1 and IC2). Thus, although the clt sequences of Streptomyces conjugative plasmids are varied, they contain multiple direct repeats and/or inverted repeats. Reuther et al. report that TraB protein of pSVH1 binds to a 50-bp clt-like sequence containing a 14-bp direct repeat, producing a protein-DNA complex too large to enter an agarose gel, indicating that multimers of TraB are bound to the DNA. Vogelmann et al. show that TraB specifically recognizes repeated 8-bp motifs on pSVH1 mediated by helix α3 of the C-terminal winged-helix-turn-helix domain of the protein, and TraB assembles as a hexameric ring structure with a central 3.1-nm channel and forms pores in lipid bilayers. By removing the N-terminal trans-membrane domain, TraA of pWTY27 can be expressed in E. coli as a soluble protein. TraA recognizes and binds specifically to two regions, one (9797–9849 bp) containing all the four DC1 and one DC2 and most part of IC1 and another (9867–9897 bp) covering two DC2 and part of IC1 of the clt, suggesting that formation of a high-ordered protein-DNA complex. In this work, a widely distributed Streptomyces strain Y27 along with its indigenous plasmid pWTY27 from plants and soil samples cross China are identified by both culturing and nonculturing methods. The complete nucleotide sequence of pWTY27 consists of 14,288 bp. A minimal locus for plasmid replication comprises repAB genes and an adjacent iteron sequence. RepA protein binds specifically in vitro to a long inverted-repeat (i.e. IR2) of the iteron sequence. Plasmid containing the replication locus and two telomeres from Streptomyces linear plasmid can propagate in linear mode, indicating a bi-directional replication mode for pWTY27. As for rolling-circle plasmids, a single traA gene and a clt sequence on pWTY27 are required for plasmid transfer. We find that TraA binds specifically to the two regions of the clt sequence, one containing all the four DC1 of 7 bp (TGACACC) and one DC2 (CCCGCCC) and most of IC1, and another covering two DC2 and part of IC1, suggesting formation of a high-ordered DNA-protein complex. Strains and plasmids used in this study are listed in Table 1. Streptomyces lividans ZX7  was the host for plasmid propagation and conjugal transfer. Streptomyces culture, isolation of plasmid and genomic DNA, preparation of protoplasts and transformation, and pulsed-field gel electrophoresis followed Kieser et al. . Plasmid conjugation from E. coli ET12567 (pUZ8002) into Streptomyces strains followed Bierman et al. . Plasmids pSP72 and pFX144 were used as cloning vectors. E. coli strain DH5α was used as cloning host. Plasmid isolation, transformation of E. coli and PCR amplification followed Sambrook et al. . Isolation of endophytic actinomycetes from Chinese medicinal herbs followed Cao et al. . The plant samples were submerged sequentially in 75% ethanol for 5 min, 0.9% sodium hypochlorite for 10 min, 10% sterile sodium bicarbonate for 10–20 min (10 min for leaf, 20 min for stem) and then washed by sterile water three times. The samples were cut into 1-cm2 pieces and were inserted in different media (e.g. TSB [Tryptone Soya Broth powder 30 g, agar 20 g/L] S [glucose 10 g, tryptone 4 g, K2HPO4·3H2O 0.5 g, MgSO4·7H2O 0.1 g, CaCl2·2H2O 0.1 g, Ferric citrate reserving solution (1% (w/v) citric acid, 1% (w/v) ferric citrate) 1 ml, trace element solution (H3BO31.5 g, MnSO4·H2O 0.49 g, ZnSO4·7H2O 0.6 g, CuSO4·5H2O 0.1 g, (NH4)6(Mo7O2)4·4H2O 0.2 g, CoSO4·7H2O 0.01 g) 1 ml, agar 20 g/L] and Gause’s synthetic agar [soluble starch 20 g, KNO3, 1 g, NaCl 0.5 g, K2HPO4·3H2O 0.5 g, MgSO4·7H2O 0.5 g, FeSO4·7H2O 0.01 g, agar 20 g/L]) containing 25 ppm K2Cr2O4, 15 ppm nalidixic acid and 25 ppm nystatin. After incubation at 30°C for four weeks, actinomycete colonies were picked. Actinomycete strains were identified as Streptomyces strains by PCR amplification (primers: 5′-AGAGTTTGATCCTGGCTCAG-3′ and 5′-TCAGGCTACCTTGTTACGACTT3′) and sequencing of the 16S rRNA genes. The sequence of the 16S rRNA gene of Y27 was deposited in the GenBank under accession number JN207128.1. pWTY27 DNA was digested with restriction endonucleases ApaI, BamHI, BclI, BglII, ClaI, EcoRI, HindIII, KpnI, MluI, NcoI, NheI, PstI, SacI, XbaI and XhoI to make a restriction map, and the unique SacI-digested plasmid DNA was cloned into pSP72 to obtain pYQ1. Shotgun cloning and sequencing of pYQ1 were performed on an Applied Biosystems Genetic Analyzer model 377 at the Chinese Human Genome Center in Shanghai. 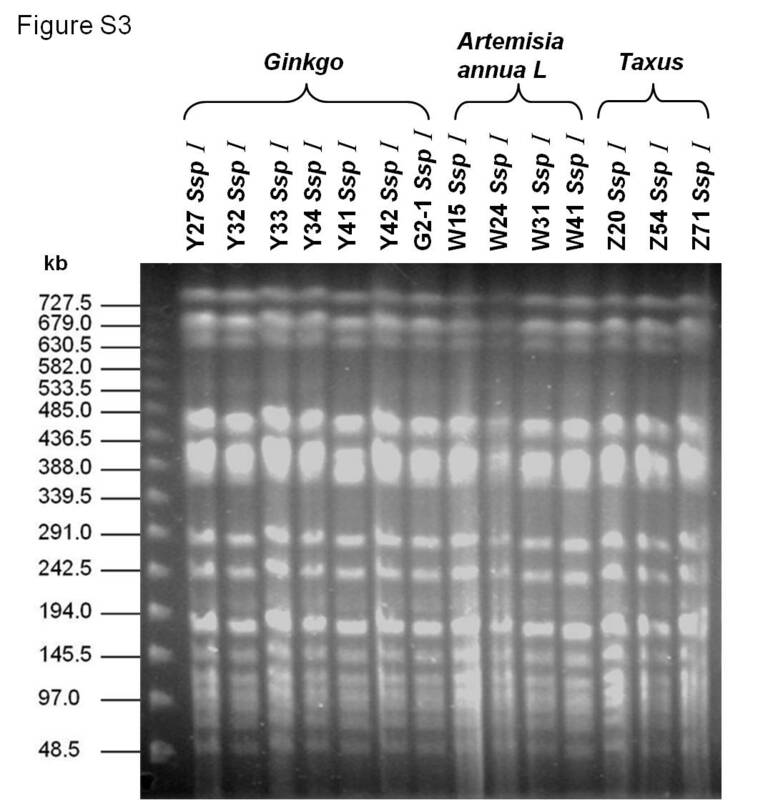 Analysis of Streptomyces protein coding regions was performed with “FramePlot 4.0 beta” (http://nocardia.nih.go.jp/fp4/), and ATG or GTG or TTG was used as start codons. Sequence comparisons and protein domain searching were done with software from the National Center for Biotechnology Information (http://www.ncbi.nlm.nih.gov/Blast.cgi). DNA secondary structures (e.g. direct repeats and inverted repeats) were predicted with “DNA folder” (http://mfold.rna.albany.edu/?q=mfold/DNA-Folding-Form) and “Clone manager version 9” (http://www.scied.com/pr_cmpro.htm). The GenBank accession number for the complete nucleotide sequence of pWTY27 is GU226194.2. Apramycin resistant transformants in S. lividans ZX7 were obtained for plasmid pWT24 carrying a 5.4-kb fragment (13942–14288/1–5114 bp of pWTY27). Various segments of the 5.4-kb sequence were PCR amplified and cloned in pFX144 to obtain plasmids pWT147, pWT219, pWT217 and pWT222. Sequences of 95 bp (1073–1167 and 259 bp (2433–2691 of pWT24 were deleted by digesting with MluI and NotI to obtain pWT34 and pWT33, respectively. 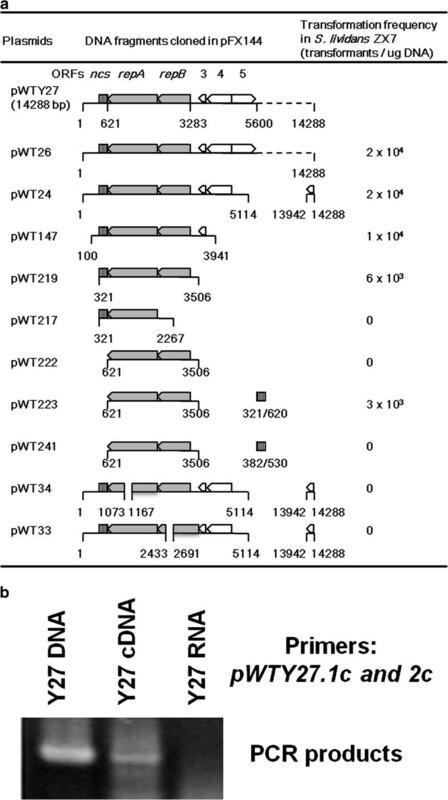 These pWTY27-derived plasmids were constructed in E. coli DH5α and introduced by transformation into S. lividans ZX7. To compare transformation frequencies of plasmids in different experiments, we used 0.1 ng DNA (diluted from a concentrated solution) of Streptomyces plasmid pIJ702  each time and took 1 × 106 transformants per μg DNA as a control frequency. Strain Y27 was inoculated into tryptone soya broth (TSB, Oxoid) liquid medium, and RNA was isolated following Kieser et al. . The RNA samples were treated with DNase I (RNase-free, Takara) to remove possible contaminating DNA and reverse-transcribed into cDNA by using SuperScriptTM III Reverse Transcriptase (Invitrogen). Two primers (5′-GTGAATCTTGGGCTCGCCCTTG-3′/5′- GCCGAGAAGTGCATCCGCAAC-3′; the expected size of the PCR product is 302 bp) were used to allow amplification of segments extending from each replication gene into its immediate neighbor. PCR conditions were: template DNA denatured at 95°C for 5 min, then 95°C 30 s, 58°C 30 s, 72°C 30 s, for 30 cycles. The repA gene (621–2198 bp) of pWTY27 was cloned into the EcoRI and HindIII sites of E. coli plasmid pET28b to obtain pWT111, which was then introduced into E. coli BL21 (DE3). 1 mM IPTG (isopropyl-β-D-thiogalactopyranoside) was added to a log-phase culture at 16°C for 12 h to induce over-expression of the cloned gene. The 6His-tagged RepA protein was eluted in buffer containing imidazole and was purified to ~90% homogeneity by Ni2+ column chromatography following the supplier’s instructions (Qiagen). The 300-bp sequence (321–620) was PCR-amplified and end-labeled with [γ-32P]ATP using T4 polynucleotide kinase (New England BioLabs). The DNA-binding reaction was performed at room temperature for 10 min in buffer (20 mM Tris–HCl at pH7.5, 100 mM NaCl, 1 mM ATP and 10% glycerol). PolydIdC DNA was used as non-specific competitor and unlabeled probe as specific competitor. The reaction complexes were separated on a 5% native polyacrylamide gel in 0.5× Tris-borate-EDTA buffer at 120 V for 1 h. Gels were dried and analyzed using the Phosphorimager (Fuji). Similarly, the truncated traA gene (8124–9836 bp) of pWTY27 was cloned in pET28b to yield pWT371. The 6His-tagged TraA protein was purified by Ni2+ column chromatography and was incubated with the 175-bp (9803–9977) PCR fragment labeled with [γ-32P]ATP at room temperature for 15 min. The DNase I footprinting assay followed Pan et al. . Primer FTr (5′-TCGAACACGCAACCGAAAGGCCG3′) was end-labeled with [γ-32P]ATP using T4 polynucleotide kinase, and then a 300-bp (321– 620) DNA fragment was PCR-amplified with primers 32PFTr and FTf (5′-CGGCCGCCGTCCGTCTGGTG-3′), followed by purification with the Wizard SV Gel and PCR Clean-Up System (Promega). Ca. 40-ng labeled DNA and different amounts (0.17, 0.43, 0.85 and 2.6 μg) of the purified RepA protein were incubated at room temperature for 10 min in a 56-μl binding buffer (20 mM TrisHCl pH 7.5, 100 mM NaCl, 1 mM ATP-Na, 10% glycerol). 1 Unit DNase I (Promega) was added for 1 min and the reaction was stopped by adding 50 μl stop solution (20 mM EGTA, pH 8.0). DNA was extracted with acid phenol/chloroform solution and precipitated with isopropanol and ethanol. Sequencing ladders were prepared with FTr using the SILVER SEQUENCETM DNA Sequencing Reagents (Promega). The digestion products together with the ladders were analyzed in 6% polyacrylamide (adding 7 M urea) gel. Gels were dried and scanned with the Phosphorimager. Similarly, to determine the binding sequence of TraA protein and clt sequence, primer Fcltf (5′-CAAGGACTTCATGGACTGGTGCGA-3′,) was end-labeled with [γ-32P]ATP, and then a 406-bp (9671–10077) DNA fragment was PCR-amplified with primers 32PFcltf and Fcltr (5′-CGTGCTCGGCCTGCTCCAGGA-3′). About 40 ng labeled DNA and different amounts (0.6, 1.4, 2.8 and 4.2 μg) of the purified TraA protein were incubated at room temperature for 15min. To identify a locus for plasmid conjugal transfer, various pWTY27 fragments around pWTY27.9 were cloned in E. coli plasmids pWT203 which contained the rep/rlrA/rorA genes required for replication and stable inheritance of the non-conjugative Streptomyces plasmid pSLA2 (31) or pWT224 (carrying intact traA). These plasmids were introduced by transformation into S. lividans ZX7 to produce donor strains for conjugation. The recipient strain was S. lividans ZX7 with a chromosomally integrating plasmid pWT181 containing the integrase gene of ΦC31  and selection marker tsr. About equal amount (ca.108) of spores of the donor and recipient strains were mixed and incubated at 30°C for 5 days. Spores were harvested, diluted in water and plated equally on Luria-Bertani (LB) medium (thiostrepton, 50 mg/L), LB (apramycin, 50 mg/L) and LB (thiostrepton + apramycin). The frequency of plasmid transfer = 100 × ratio of colonies on LB (thiostrepton + apramycin) to colonies on LB (apramycin). Twelve soil samples from 12 cities in nine provinces (Wuhan, Huanggang and Xianning cities of Hubei, Changde and Hengyang of Hunan, Nanjin of Jiangsu, Linyi of Shandong, Anyan of Henan, Xingtai of Hebei, Guiling of Guangxi, Shanghai, and HongKong) in China were collected. Ca. 0.2-g soil sample and 0.5 g glass beads mixed in 1 ml buffer SLX Mlus were vibrated for 5 min and then were lysed in buffer DS at 90°C for 10 min. Crude genomic DNA was isolated by using the E.Z.N.ATM Soil DNA Kit (Omega). To amplify the pWTY27 repA from the soil DNA, nested PCR amplifications were employed . The first round of a PCR reaction was performed using primers (5′-CAGGTCAGGGTGCCCATGCCGTAC-3′, 5′-CGTACCCGCCTTGTACGTCCGCAG-3′) and KOD FX enzyme (Toyoba) under conditions (98°C 10 s, 60°C 30 s, 68°C 40 s for 30 cycles), and then 1 μl PCR product was added for the second round of the PCR reaction with primers (5′-CGGTCGCTCTGCTGCACCCAG-3′, 5′-GCGAGCCCAAGATTCACCGTCTG-3′) under conditions (98°C 10 s, 58°C 30 s, 68°C 30 s for 20 cycles). Similarly, to amplify the Y27 oriC, two primers (5′-ATGCACGCCGACCGCAAGATC-3′, 5′-AYRSGTTGCCGAACAGTGGACA-3′) were used for the first round, and nested primers (5′-CCACGGCCCCGAATCCGCCTC-3′, 5′- GCACAACACCGGCCTGCCTGTG-3′) for the second round of the PCR reactions. To amplify the A3(2) oriC, primers used in the first round reaction were the same as in the Y27 oriC, and new nested primers (5′-GCCTTTCCCATGCCCCT.GGGT-3′, 5′-CCTGCCCTGATGATCCCTCACCAG −3′) for the second round of the PCR reactions. We are very grateful to Sir David Hopwood for critical reading of and useful suggestions on the manuscript. This work was supported by grants from National “973” project (2011CBA00801), National Nature Science Foundation of China (31121001) and the Chinese Academy of Sciences project (KSCX2-EW-G-13). TW designed and performed all the experiments. ZC, QC, MZ, XT and LZ isolated endophytic Streptomyces strains and identified plasmids. PX and MS constructed plasmids. ZJQ was involved in project design, and prepared the manuscript. All authors read and approved the final manuscript.